I'm pleased to introduce you to a book that I didn't write. My Girlfriend's Boyfriend, the novel. 1. "What" You say to yourself. "But I've already seen the movie!" 2. "What? You say to yourself. "But I haven't even seen the movie!" If you answered 1... you're in luck! If you answered 2... you're in luck! The book is exactly like the movie. And different. Elodia Strain (the talented author of Icing On The Cake and Previously Engaged) has taken the movie and given the story a completely new spin. 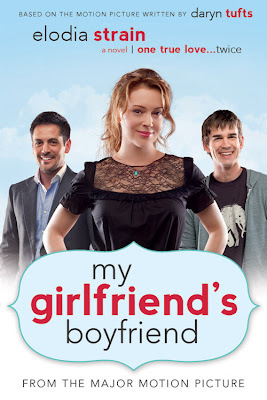 My Girlfriend’s Boyfriend: The Novel takes the narrative from the film and adds new characters, storylines, details, depth, and a lot of humor. While doing so, this author has skillfully kept the story from the movie intact - with all of its twists and turns – while creating something different and unexpected. Best of all, in the book, Elodia shows us the world through the eyes of Jesse (played by Alyssa Milano in the film).Told almost entirely from Jesse’s point of view, the reader gets a chance to really get to know this character and experience what a warm, quirky, funny, and unique girl she is. The Book is On Sale Now! your local Costco or Deseret Bookstore. In the near future, we'll be having an official Book Release Party. Elodia and I will both be there and I'll announce the date and time as soon as I know it. I'm a writer and director who enjoys producing movies, commercials, and other types of advertising and marketing. If you're interested in seeing what I'm up to, take a look at my pages. If you have any questions or would like to speak about the possibility of working together, send me an email anytime.